“All things move, all things run, all things are rapidly changing. A profile is never motionless before our eyes, but it constantly appears and disappears”. This sentence belongs to the 1910 Manifesto of Futurist painters which was written also by Boccioni himself, and it is the basic text that allows us to understand his work. In his paintings Boccioni depicted the movement, the ferment of life, and the emotions of modernity. 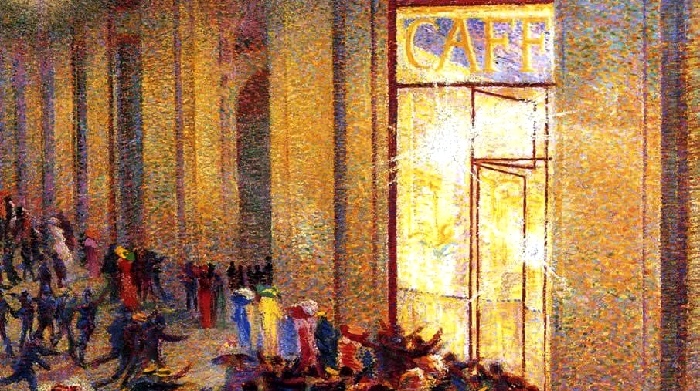 In this post I’m talking about Riot at the Gallery, a painting representing all the energy and movement of a fight in front of a Café in Milan. 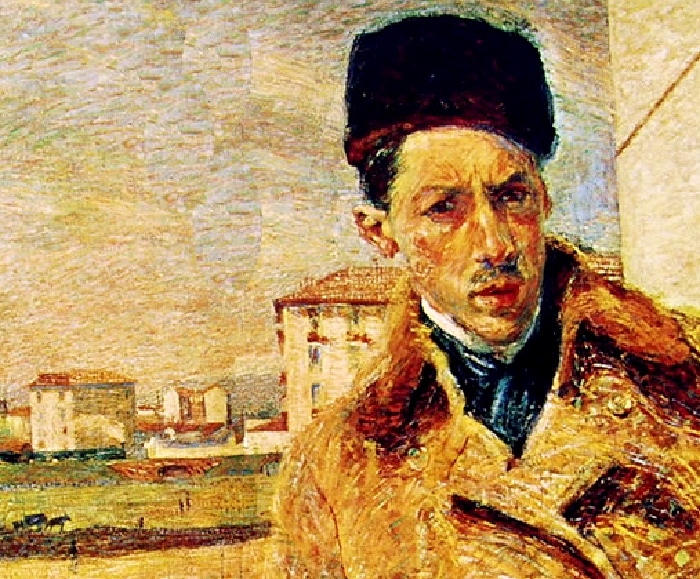 Umberto Boccioni, Self Portrait ((1908) – Pinacoteca di Brera, Milan. Milan was the city whose background fully conformed with the Futurist works by Boccioni. In this painting for the first time the artist uses the colour to express the vivacity and the energy of a melee happening under artificial lights at the Vittorio Emanuele II Gallery in Milan. Boccioni painted Riot at the Gallery between 1910 and 1911, and he had just returned from Paris. Milan was dynamic and was quickly becoming a modern city, productive in production industry and efficient in trade. The painting is a description of a real fight arisen from an unknown reason at the Gallery, one of the symbols of the modern city of Milan. In the early 20th century Milan from a provincial town was becoming the financial capital of Italy. Boccioni was fascinated by this transformation. He wanted to describe it through a painting in which colours played a crucial role, because they could give the necessary dynamism to the scene. This is one of the paintings in which Umberto Boccioni tests the Pointillist technique devised by George Seurat, as I wrote in the post in which I described Sunday at Port-en-Bessin by Seurat himself. Riot at the Gallery is based on a circular movement of the figures involved in the melee. They push the viewers to focus on the central point of the canvas in which two undefined figures (one green figure and one blue figure) seem to be the centre of the scene and the real protagonists of the fight. 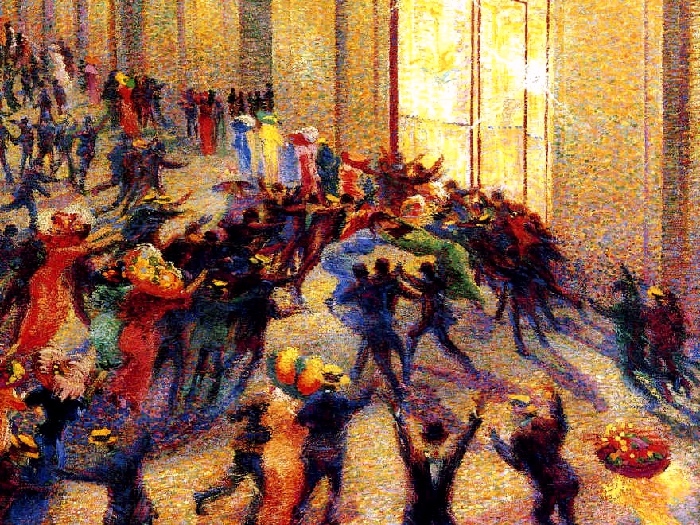 The vibrant colours are juxtaposed, like in the Pointillist technique, giving the viewer the impression that the crowd is moving. Boccioni represents not only a physical gesture, but also the tension of an instant, in which fear, euphoria, violence, and all the emotions a modern city can offer, appear. Riot at the Gallery was donated to Brera Art Gallery in Milan in 1976. Umberto Boccioni, Riot at the gallery (1910) – Pinacoteca di Brera di Milan (detail).